Let's Dance provides dance sessions in schools for children of all ages, including those with special needs since 2003. 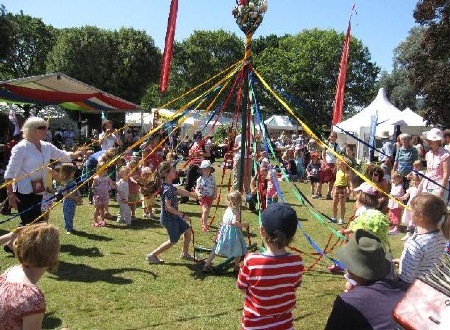 Let's Dance specialises in folk dancing, longsword, maypole and morris dancing. We also run events such as barn dances, birthday parties and clubs for all ages and abilities. Jane - Was formerly a deputy headteacher with the London Borough of Barnet. She now works regularly as a freelance folk dance workshop leader for schools and other organisations including the English Folk Dance and Song Society. Jeremy - Jeremy plays piano accordion and alto saxaphone for London Pride Morris, EFDSS weekly classes and for Let's Dance. He has appeared on television and in the foyer of the Royal Festival Hall and played with a number of Ceilidh and Festival bands. He has provided music for an educational DVD and has been filmed as a part of Street Dance 3. We are both CRB checked, references are available on request. Jane : email - pfaff.jane@gmail.com or phone 0208 346 9986. Jeremy : email - jeremy@monson.org.uk or phone 0207 226 9286. If you have any comments on this web site please send them to the WEBsite-Design .